The Samsung S27E370D stands out from the usual fair for a couple of reason. For a start, just look at it! This is a white monitor, so if you are in the market for a light coloured screen then this will be of interest to you immediately. Any white monitor is going to draw some kind of Apple reference as they seemed to have claimed that colour but the square sharp lines set this apart. The second point of interest here is the inbuilt Qi charger. I’m not sure if this is a gimmick or genuinely useful? I suppose if you have a wireless phone then it could be of interest to you. Should it be the main driver of your monitor purchasing decision? I wouldn’t have thought so. I am a regular user of wireless charging on my Nexus phone but this some how doesn’t really excite me. You may feel different. What else do you get for your money? A 27″ screen with Samsung’s well regarded display technology. It’s an HD display, which might not be what some gamers are after at 27″, 1440p seems more popular right now. But on the upside it does feature the AMS adaptive display technology, FreeSync. 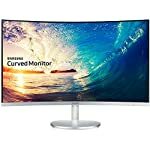 The Samsung display is a smart looking monitor, the white colour will have additional appeal to anyone who prefers a change from the usual black and grey. This colour is typically associated with the Apple brand so it might appeal to anyone who relates to their marketing appeal. It has an attractive narrow bezel bordering all four sides, with a light blue “touch of colour”. Connectivity includes DisaplyPort and HDMI port. As mentioned previously, the monitor includes a wireless Qi charging capability presumably for your Samsung Galaxy phone (any Qi compatible phone will work!). There does not appear to be a great range of adjustment options, in fact it looks like you are limited to just tilt. The S27E370DS is a 1080p HD screen so it is never going to look quite as clear as a 1440 or above 27″ screen. There are a couple of good reasons to stick with HD for now, it is cheaper for one, and if your PC spec isn’t exactly top line then you might struggle to hit the top frame rates with high detail settings in modern games. You can also be sure that all games and applications will run at 1080p resolution and look good. Some applications have scaling problems on high resolution monitors, i.e. the text looks very very small! The monitor includes a game mode for “an optimised gaming experience through the on-screen display. Game Mode improves the darkness of the picture so that you can see all the action vividly”. Whether or not you believe the marketing speak or not at least they are trying to make an improved experience for gamers. More importantly, the monitor has FreeSync support. So assuming you have a compatible AMD card you can expect smooth tear frame games. FreeSync changes the refresh rate of your screen to match the output of your video card. It won’t work if your frame rate dips too low but for the most part if gives you a much improved gaming experience. 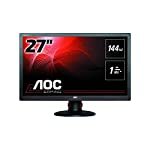 This monitor has a maximum refresh rate of 60hz, some gamers will prefer higher. The PLS panel is Samsung’s answer to IPS, it gives wide viewing angles and excellent colour accuracy. The monitor also boosts a bright screen giving you a vivid and brilliantly clear image (according to Samsung). A 4ms response time ensures that this is a responsive panel that will be good for games and work. We give the Samsung S27E370DS a 5 out of 5 rating. Want to know what existing owners of the monitor think? You can read real user reviews here. Should I buy the Samsung S27E370DS? 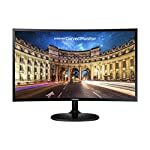 The S27E370DS is a smart looking 27" gamer friendly monitor, it features a responsive PLS display and FreeSync technology. 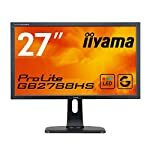 It operates at a maximum of 60hz and a 1080p resolution. If you are having some doubts about this purchase then why not read some real owner reviews and see what other buyers think.